After laser printing on bread, one can print instruments! My friend Amit Zoran designed this really neat concept of an acoustic guitar sound box that has been given a unique sound and behavior through a CAD/CAM process. His research goal at the MIT Media Laboratory in the Ambient Intelligence research group, is to find and analyze a space for structural innovation, especially for acoustic instruments. His works enables players to customize their own sound by assembling different sound cells, e.g physical parts of the instruments designed in CAD/CAM, instead of considering the instrument as one big sound box. Each string can have its own bridge and each bridge can be linked to different cells. By changing a cell' size, material or structure, one can create customizable sounds. His innovative take mainly consists of printing, using a 3D printer, cells drawn into a vectorial software. These cells, made of 30cm radius, have a variety of materials strong enough to carry the pressure of the strings and handle resonance. People can download recommended sound cells from the internet in order to change or manipulate their guitar sounds. In the near future, Amit is planning on testing the physical behavior of different combinations and to find optimal structures. But the vibration transfer is done at the bridge so I don't see how this would work. Pretty though. The resonance happens also in the cells. By tailoring different cells, he is able to produce different sounds. He made a prototype at the lab with the 3d printer and transformed the cells into an instrument using strings, and it works. I heard that Amit is looking for someone to help him with bridge designs maybe for this reason. Interesting use of technology. I saw the picture linked elsewhere and immediately thought of the people at RedEye (a division of Stratasys, the makers of the Dimension FDM '3d printers'). 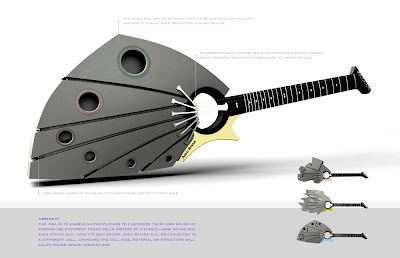 They made custom electric guitar bodies using their rapid prototyping machines. do u think yingwie will buy one? RSS feed what is in my pocket! Is this a land made for you and me?